Exhibiting at tradeshows is a big investment. Everyone who exhibits hopes for a good return on investment, coming from sales generated from the show. Handing out, statement making, branded promotional products will assure potential customers remember your company long after the show is over. Bags: Conference attendees need bags to carry all of their conference literature and swag. However, often times, conference bags are either disposable or too bulky to bring home. Give attendees a durable, foldaway bag. Not only do these bags hold more than 20 pounds, they can also be easily stowed for traveling home and used time and time again. Things with Carabiners: Hands are always full at conferences. Items with carabiners can be easily strapped on to purses and work bags. Sunscreens and hand sanitizers with carabiners are most popular at tradeshows and let’s face it, conferences are germy. There’s a lot of hand shaking and lunches consisting of a hot dog or burger. That’s just one reason people LOVE receiving hand sanitizers at conferences. Lip Balms: A new climate, dry indoor air and dehydration from traveling can all cause dry lips. Attendees will flock to your booth for a lip balm giveaway; this is the one of the best giveaways for under $1. Reusable Straws: Show your commitment to the environment with stainless steel reusable straws. Give away single straws with your engraved logo or choose a straw and cleaner set. Reusable straws are one of the hottest promotional products right now and stainless steel straws will be used for years. Utensil Sets: Like straws, reusable bamboo utensil sets show your green side and will be used time and time again. Customers will see your name every time they use their sets. Water Bottles: Over the past decade people have moved away from single use water bottles. 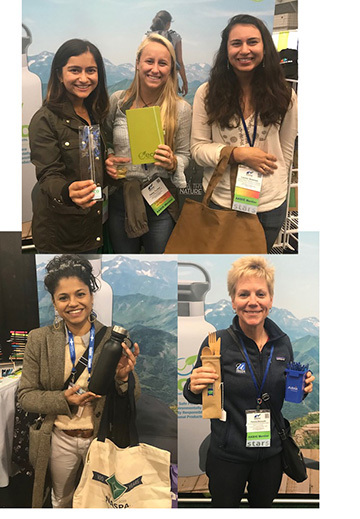 Reusable water bottles have become such a popular giveaway that many people have accumulated them. Daily reusable water bottle users are selective in their bottles and may decline a low-end water bottle, knowing they will never use it. Choose a high-quality bottle that customers will take home and use. Statement Notebooks: Instead of a basic spiral notebook, consider notebooks that are functional and beautiful to look at like Moleskine® or journals made from recycled apple peels that actually smell like apples. Pens: Pens are a great low-cost giveaway but choose a high quality pen like the popular Pilot B2P pen made from recycled water bottles. Not only is this a great pen to write with, it also showcases your commitment to sustainability. Anything Plantable: Extremely eco-friendly planting kits and seed packets come with the message of you growing together with your customer. High Quality T-Shirts: Like water bottles, t-shirts are a staple in swag bags. Many of these t-shirts never see the light of day because they are ill fitted, scratchy or just not fashionable. Choose a high-quality t-shirt made from cotton or recycled material that people will love wearing. Your customer will remember you and they will also be a walking billboard for you when they wear their t-shirt around town. With any event, you should always consider your audience. Eco Promotional Products is happy to help you choose the best products for the demographics of your event.